Kape Communications was contracted to coordinate Arts West, a cooperative arts marketing initiative for Creative Victoria, the Victorian Government's arts funding body. 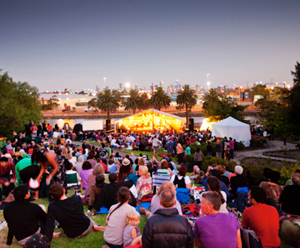 Arts West includes nine arts organisations in Melbourne's fast growing inner western suburbs. Kape Communications secured funding $150,000 for Arts West from Gandel Philanthropy, Lord Mayor's Charitable Foundation and Creative Victoria. Part of the year long consultancy included professional development for the nine member organisations in; ethnic media relations, income generation and cultural brokerage.